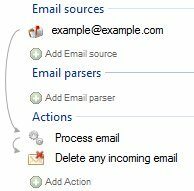 Email Parser automatically downloads any new email from the email sources but the downloaded email is kept on the email source unless you use a “Delete email from source” action. 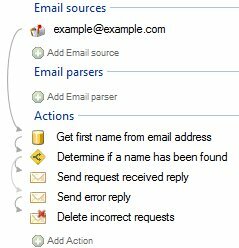 This kind of action is specially useful if you have limited space in the inbox of the email account as it can eventually get full and stop accepting new emails. It is also used to kept the inbox clean and free of unwanted email, including spam. Delete processed and unprocessed emails. 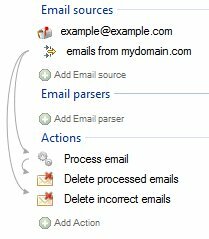 Two email delete actions.